Clayton caught 96 passes for 2004 yards and 10 touchdowns in college (20.9) avg., including 53 for 1112 yards (21.0 avg.) and six TDs as a senior in 1982. 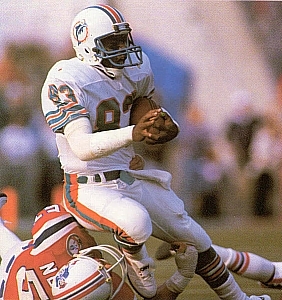 He was chosen by the Dolphins in the eighth round of the ’83 NFL draft and saw little action on offense as a rookie, with six catches for 114 yards and a TD, although he returned 41 punts for a 9.6-yard average and included a touchdown. Clayton replaced the aging Nat Moore in the starting lineup across from WR Mark Duper in 1984. Dolphins went 14-2 to finish first in the AFC East with the conference’s best record and led the NFL in total yards (6936), passing yards (5018), passing TDs (49), touchdowns (70), and scoring (513 points). Won AFC Divisional playoff over Seattle Seahawks (31-10) & AFC Championship over Pittsburgh Steelers (45-28). Lost Super Bowl to San Francisco 49ers (38-16). Having set a then-NFL record for touchdown catches in his breakout ’84 season, Clayton followed up with 70 catches for 996 yards (14.2 avg.) and four TDs in 1985, again being selected for the Pro Bowl. The undersized receiver had great jumping ability and quickness, if not the greatest speed, and made for a productive tandem in combination with Mark Duper and catching passes from QB Dan Marino. Clayton was named to another Pro Bowl in 1986 and, following a lesser year in the strike-interrupted ’87 season, caught a career-high 86 passes in 1988 and led the NFL with 14 touchdown receptions. Overall, he played ten years with Miami, through 1992, and set franchise records with 550 catches and 81 TDs while gaining 8643 yards (15.7 avg.). Clayton played one final season for the Green Bay Packers in 1993 and ended up with a total of 582 pass receptions for 8974 yards (15.4 avg.) and 84 touchdowns. He received first- or second-team All-AFC honors three times and was chosen to the Pro Bowl on five occasions.